Well it's been an awesome 14 months or so, but it had to come to an end sometime. In six hours time, voters across Tallaght Central are going to the polls. I am immensely proud of the campaign we have run. I have engaged dozens of young people in active politics, in what has been the most substantial youth-driven campaign in Ireland - in one of the largest LEA's. I have brought real Labour values and politics to thousands of residents in community campaigns and through our political messages. It is worthwhile and of itself to have put forward such a campaign, but its legacy will be stronger still with an electoral mandate tomorrow. I am asking blog readers to do just 3 things. 1. Vote Dermot Looney #1 in Tallaght Central, and transfer to my Labour colleagues, then keep left against the government. 2. Please vote Proinsias de Rossa #1 for Europe and do likewise. If you are not living in Tallaght Central, please vote for your local Labour candidates to build the real alternative in Irish politics. 3. Choose the friends you have in Dublin 12, 6w and 24. Then text, email, call, tweet, or send messages on facebook or bebo to them asking them to vote Dermot Looney #1. Take those 5 minutes now to make the difference. There were many events and moments on the canvass today which I would love to blog, but tiredness and the early start tomorrow mean they will have to wait. Hopefully, there may be some opportunities to post during the quiet times tomorrow. In the meantime keep your eye on www.irishelection.com - who tonight called our web campaign "ace" - for the latest news. As a young child I was deeply touched and inspired by Nelson Mandela's long walk to freedom and the queues and queues of people in South Africa's first free election. Those votes were won by an incredible struggle against a racist apartheid regime that seemed untouchable. Our right to vote comes from equally noble and oft-bloody struggles, from the Suffragette movement and the campaign to extend the franchise to more than just men of property, to the independence movement in Ireland and the great democratic revolutions of trade unionism and the Land League. Building the future is most prominent in the politics I espouse, but remembering the past must provide the foundation. Be sure to vote - and use it well! 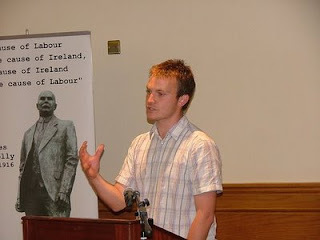 Guest Post - Paul Dillane : "Time to Go Looney and Labour"
Paul Dillane is Campaign Manager of the Looney for Tallaght Central campaign. The local election campaign of 2009 is now drawing to a close. By far the most response on the doors has been “so long as you are not Fianna Fail.” It has been a dramatic fall from grace for a party that swept the board at the general election. When the short, intensive run in to the local elections began, the Dermot Looney campaign turned itself from its focus of political activism on local issues to attempting to gather votes from involvement in these issues. Again and again, we argued with people on the doors that the time was right to elect a campaigner to the council who would continue in the best traditions of Labour in the area. One of the most encouraging aspects of the campaign has been the opportunity to politically engage with people across the ward of Tallaght Central. There is huge anger at the government and a good deal of disillusionment abroad. Convincing people that a political alternative is available has been a real task. Many voters who opted for FF in previous elections are willing now to stitch allegiance. But those voters are often very weary of a potential Fine Gael government. We have insisted that we are campaigning for a Labour led government that represents a real break from the past, a real possibility in the now much altered political landscape. There has been plenty of craic on the campaign trail. Meeting the occasional political loyalist from opposition campaigns has lightened the load considerably. The political grilling is part of the course for canvassers, or knockers as we are known in the states - or bashers, as we are called in some traditional elements of Irish political activism. Almost every voter, however, has been courteous and welcoming and willing to engage. If you are a voter in the Tallaght Central ward, and you haven’t made up your mind, but are thinking of going Looney, I have a lot to say to you. However, I am warned that the blogospherere won’t hold pages of argument so I have condensed my case into 2 points. - Voting Labour is the way to put up a signpost to a new society in Ireland that is genuinely Republican and Democratic. - Don’t go toward Fine Gael. Look at their policies; they represent more of the same. None of the smaller parties can lead an alternative government. A member a party whose councillors have nearly ruined Dublin with disastrous planning (we are looking at you FF and FG), or active in a party who continue the dishonourable relationship between wealthy interests and politics that caused the scandalous planning issues in Dublin (we are still looking at you FF and FG). Please support Dermot Looney tomorrow and thanks for reading the Looney Left during this campaign. I know you're all fed up of election clichés at this stage, so I won't bore you with stories of my feet, blistered though they are, or my haircut, which the eagle-eyed amongst you might spot in before and after modes in the pictures below. No, I'm going to tell a few other clichés. Before I do, here's a pic of me at the Belgard Luas Stop this morning, where we have been leafleting and speaking to local people all week. An early start was compounded by the unbelievable punctuality of Enda Duffy, whose role in the campaign is everything from a transport manager to poster master and canvass director. He took this picture too - the "Maria Parodi" shot of my campaign! Enda arrived beyond promptly this morning - at 7.30 - and lasted until about 10 this evening. Like the dozens of others who have worked their socks off for the campaign, Enda is doing so with political reasons in mind, but I do want to thank him personally for all the months of work he has put in. I once managed Enda's unfortunately unsuccessful campaign for President of UCD Students' Union, but his management and good humour are far more successful this time out, regardless of the outcome. Those same ones amongst you with eagle eyes - or those of a hawk, like Bravestarr - will have spotted Enda in our last youtube video of the campaign. I freely admit that we had to use Enda for a 'canvass' shot as the technical side of things didn't work out on the real things, and we were under pressure for time. Now to Cliché #1: Babies and Kids. I've been followed round the doors by kids who love shouting out my name. What can only be described as a gaggle of 20 or so of them followed me around Limekiln last night with a poster - I assume they'd ripped it down - and were looking for autographs, stickers and whatever else I had going. These kids are a little more genuine in their support, or at least their mam and dad are. Colm, Kevin and Mark, my three Kerry nephews, are in Dublin for the graduation of their aunt and my 'baby' sister, Aisling - who from tomorrow will be Doctor Aisling Looney. Ash spent 6 years in UCD doing Medicine and the whole family are up to celebrate her graduation with first class honours tomorrow. Sadly, I won't make it out to my alma mater with the last-day campaigning but Aisling was out with us tonight as she'll be spending tomorrow celebrating. I'm very proud of her and she's a great example of why fees should remain off the agenda. The support from my family has been amazing, from my 71 year old dad climbing up poles to erect posters, to my mam canvassing half of Tymon Park, my other sister Tara making sambos and my three brothers constantly encouraging and supporting from Cork, Kerry and Galway. They'll be delighted when it's all over and their home, car spaces and lives are back to normal! Cliché # 2 is this fetching rosette which I wore for the first time today. We've tried to mix a bit of traditional electioneering with more cutting-edgework. It was lovely to get another mention on the front page of labour.ie today, and I know the hits were excellent because of it. We were again all over the constituency today, from the Luas leaflets in the morning, to more traditional leaflet dropping in the afternoon, and our biggest canvass of the campaign in Greenhills this evening. I was honoured to have 25 - political - brothers and sisters out with me on the doors tonight, covering a vast sweep of an area from Perrystown to Walkinstown and deep into Greenhills Estate. This picture doesn't even tell the full story - a few had headed home by the time the photo was taken at the end of the session. They say not to do such a big canvass, and that it's right to split them up into smaller groups. But as you all know, I'm not one for those political clichés - we're going to build it even bigger tomorrow, and fight hard for every vote we can in the remaining 29 hours, and right through then til 10pm on Friday. Hope to be blogging while I'm at it. Adelante! I got to bed at 3 last night, and was up just after 7. I thought blog readers might be interested in hearing about the schedule of the campaign as we hit the last few days. 8am: Canvassing Luas stops in Belgard and Kilnamanagh/Kingswood. 10am: Letter writing, folding, trips to the post office for envelopes, more writing, more folding, trips to the postbox, and back for more stamps. 1pm: Two out postering, four in licking envelopes. 3pm: Another canvass in the sun down in Perrystown. 5pm: A quick dinner above the Laurels. 6.30pm: 18 people on a mass canvass of Limekiln and Temple Manor. 8.45pm: A quick drink in the Traders with the campaign team. 10pm: Back at home to do paperwork and prepare for tomorrow. In between all of these were the usual phone calls, emails, mass texts, campaign management issues and dealing with the count. I also got to check our new ads in the Southside People and the Echo which we have paid big bucks for thanks to our fundraising work. Mercifully, I'm off work for the week but having the support of my campaign team today was crucial in getting the work done. Tomorrow and Thursday will be similar in terms of intensity, with some fresh campaign work and ideas coming to the fore. Our numbers have really been excellent but we need to push them to greater heights in the days to come. Thousands of doors still to be knocked on, and thousands of leaflets to be dropped - we can start to relax in 69 hours time or so when the polls close, and truly relax on Saturday evening when the outcome is known. All of us are looking forward to a rest at this stage, but hopefully it'll only be short-lived as we look towards an historical Council seat. It's going to be tougher and tougher to blog in the last few days of this campaign, but so many of you have told me you are readers - honestly - that I do feel a compunction. Today was most certainly a day that would give you energy. It was, perhaps, one of our best days of the campaign so far. There were more than 20 activists around at various stages - we're hoping to build that even further in the last 3 days of Campaign '09. We started off this afternoon with a canvass in the Square Shopping Centre. There was a reasonable crowd considering the gorgeous weather, and the feeling was most definitely towards Labour and our ideas amongst the shoppers and staff we met. We shared, for a time, the middle of the second floor with Christian evangelists, one of whom shouted "Vote for Jesus!" I thought I was being very clever indeed to call out asking for a second preference for Looney, only to read this evening a Miriam Lord colour piece in the Times with pretty much the same line being used. Great minds and all that. I was, again, asked for an autograph, which sounds a lot more glamorous than it is when it's generally the under-10 demographic who are interested. After ice cream we headed to Belgard and Kilnamanagh for some leafleting and a chat with a few local residents. Pat Rabbitte TD joined up with us in Kilnamanagh and seems to revel in the electioneering. We took on fluids - definitely not the traditional Bank Holiday ones - before heading back to base. Katriona had ably (wo)manned the computer while we had been on the trail, and, surrounded by paper, ink cartridges and envelopes, she proclaimed success on some of the paperwork - as necessary, if not more so, than the exercise in the Square earlier. We hit the canvass trail again this evening in Dublin 12 with, again, some first-time campaigners; how wonderful it is to be welcoming new members to our campaign even at this late stage. We received what one of our canvassers called a "phenomenal reception." He may have been a little over-zealous but certainly our message is being positively received - except for one nun who was fiercely angry at being disturbed - and recognition is very high. Perhaps it would be even higher but it is sad that so many of our posters - perhaps a third of the total - have been ripped down by, in many circumstances, rival campaigns. There are some who think they can bully a campaign which is much younger, fresher and not as well-moneyed but we have fought back in the only way we know - putting a real alternative to the voters, and keeping our eye on the ball. That they feel the need to behave in this way is perhaps indicative of the threat they feel from our supposed underdog campaign. We'll see when voters hit the polls in a little over 78 hours time.